Blog: How is the Early Fall 2014 Market? How is the Early Fall 2014 Market? After a very strong spring and summer market, sellers, buyers, and agents are wondering whether this momentum is carrying into the fall. The best metric for measuring the direction of market is inventory. 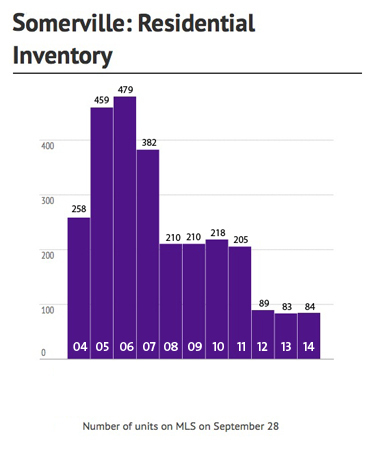 We researched inventory for the past 10 years for the early fall market. On September 28, 2014 there were 98 units of residential housing on MLS compared to 71 units on September 28, 2013. This is a 38% increase. 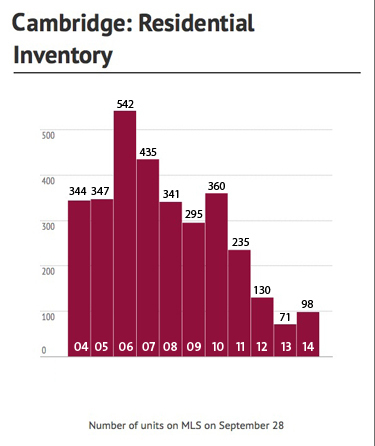 However, compared to other years in the past 10, the current inventory is still very low. In 2006, for example there were 542 units on MLS. The increase in inventory may blunt the extreme appreciation that has occurred in the past 2 years. However, inventory will need to increase much more drastically to move the market into a depreciating cycle. On September 28, 2014 there were 84 units of residential housing on MLS compared to 83 units on September 28, 2013. This indicates that market conditions in Somerville are very similar to conditions in 2013. Somerville has been a seller's market with strong appreciation since 2012. The current level of inventory indicates that the market is still a seller's market. All data from MLS PIN.